Born 18 November 1902 in Bournemouth, his musical education started at 7, taught by his mother, as were all of the family. Started work at 14 as a trainee projectionist at the Winton Picture Palace, but progressed very soon to deputising at the piano (this being the “silent” era) when the regular chap was away. Eventually went to other cinemas as pianist, then as drummer, and occasionally as organist which he had learned to play at the Methodist Chapel attended by the family. 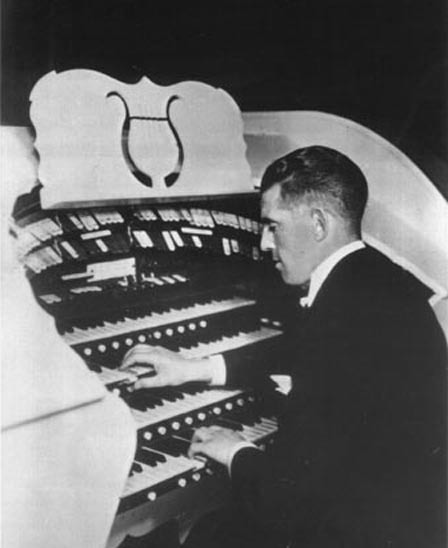 At the advent of the “talkies”, cinema orchestras were sacked but he applied for positions as an organist, many cinemas having commissioned large instruments for the new wonder cinemas of the era. He also acquired the name of ‘Jack’ by which he is always remembered, ‘Edmund’ not being considered suitable for an organist! He played at various organs from Hove to Leicester Square, Golders Green to Bristol, then in 1933 heard of a new 4 manual Conacher, to be built for the new Ritz cinema in Nottingham. Jack auditioned and was the first resident organist there, although Reginald Foort, the big name of his day, was there first. His performances, which he termed “interludes”, included not only all the popular music of the day, but classical arrangements and “stories in music”. He was proud of the fact that he wrote to personalities all over the world for information to put on the big screen whilst playing, and had replies from Franz Lehar, Richard Crooks, Toselli and Charles Laughton and many more! He stayed at the Ritz, later to become the Odeon under the Rank organisation label, for 17 years , the run only being broken by the war. His life as musician, and as author (he wrote hiking books about Nottinghamshire and Derbyshire) are very well documented, but unfortunately the one part which is not, is his time spent during the war! He Joined the RAF and went to Padgate and Filey, subsequently being transferred to 27 OTU at Lichfield Service number being 1520811, and was made an orderly to the three Padres of the station. At the same time he joined the concert party as regular pianist and orchestrator and he also helped to form the station’s Military Band. Apparently he also nipped over to Lichfield Cathedral to “sub” for the regular organist from time to time. He was invalided out in April 1945 with a duodenal ulcer. It is known that while serving he gave a number of concerts, but no broadcasts, at a variety of venues and one of the programmes obtained by cinema organ expert Roy Bingham notes that the “Wings over Lichfield” March was performed also at the Chilwell Road Methodist Church near Nottingham. Jack was particularly fond of Brass and Military bands, and much of his later compositions were done with the Ransom and Marles Band of Newark, and the Coldstream Guards in mind. His daughter thinks that it is particular fitting that Wings Over Lichfield has been “found” and is being played at the 12th RAF Lichfield Association Reunion in 2002. After the war he returned to Nottingham but eventually, television brought a fall in cinema audiences and by 1960, the resident organists found themselves redundant, including Jack! For his last years at work he moved to another cinema in Nottingham as House Manager, but occasionally did performances for the Cinema Organists’ Society, and recordings taken at these formed the basis of much of the music still played by the BBC 2 programme, “The Organist Entertains”, the presenter now being Nigel Ogden. Over the years, Jack had done many dozens of live broadcasts, of his own and other composer’s music. He wrote and arranged some 100 pieces, at least two dozen being published, and continued to write until a few months before his death on 5 March 1973.